Do you plan to participate in Community Service activities this year? The PVSA recognizes those who inspire others to engage in volunteer service by their demonstrated commitment and example. 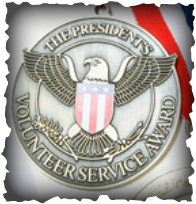 ​Along with the ultimate honor of presidential recognition; qualifying SMHS Students who achieve the required number of service hours (see below for award levels) between March 29, 2019 and March 27, 2020 will receive a personalized certificate, an official pin and a congratulatory letter from the president of the United States. Service hours must represent altruistic activities, intended to promote a particular cause or the welfare of others, delivered without payment or personal benefit. Additional information and logs are available in the turnstile in the main office. Please maintain your logs throughout the year and turn them in to the front office by March 27, 2020. Only signed logs will be accepted.